Magma (external) needs to be sprayed onto a dry roof on a dry day. It is only sprayed by qualified personnel who are familiar with Thatched Roofs. 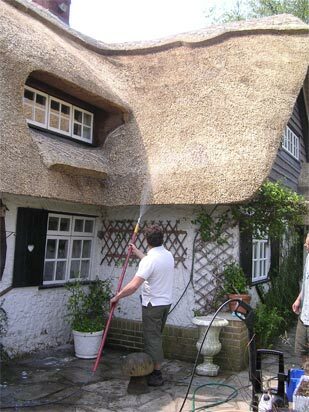 In fact about 90% of our certified sprayers are qualified Thatchers who understand the delicacy of thatched roofs. This has the benefit that you have someone working on your roof who understands the thatch. They use the appropriate pressure pump, lance and nozzles to spray the roof at the relevant application rate. Most Magma spraying is done from the ground using the special extending lance or from a ladder, unless the roof is very high in which case scaffold or cherry pickers can be used. The average roof takes between ½ to 1 day to spray, including preparation of the site. Magma spray dries within a few hours. Magma Firestop is safe to use and is environmentally friendly and a non-borate based product. It does not change the appearance of the thatch (it is a watery milky colour which dries clear). Re-application of the product is generally required every 5 – 7 years. This is due to the natural degradation of the thatch. A Treatment Certificate is supplied on completed Magma sprayed roofs (on full receipt of funds), which can be used for obtaining insurance Premium Reductions. The internal thatch Magma spray and wood spray are similarly applied with subtle differences ie application rate. Treatment Certificates are also issued. If you are uncertain about anything regarding Magma Firestop fire retardant spray please do not hesitate to contact us by email or phone and we are happy to help. There are also Data Sheets and a General Magma Firestop leaflet to download.